I have a Michigan 3-cylinder shay model exclusively for Pacific Fast Mail but I am unable to find any information on this model. Could you help or put me onto someone who can? I am performing archival and pictorial research for a public television documentary film production on the history of the San Francisco Bay. 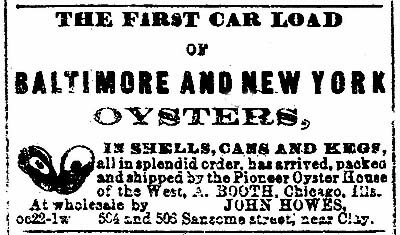 We are attempting to locate original photographic prints or negatives of the stock cars used to transport seed oysters from the East Coast to the San Francisco Bay area on the transcontinental railroad beginning in 1870, and live fish from 1874 onward. 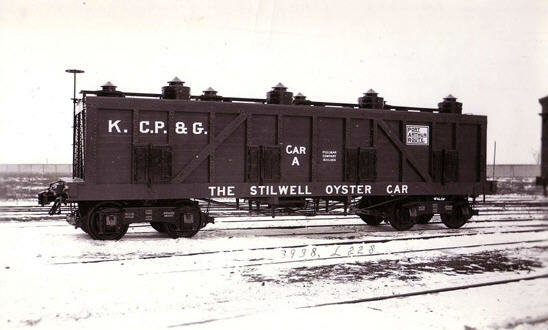 The oyster cars that ran prior to 1874 were apparently a private, commercial operation. The live fish cars were used by the U.S. Fish and Fisheries Commission for distributing fish stock to America's waterways. If your archive contains negative or print images that meet these general descriptions, we would be interested in determining their suitability for inclusion in our documentary film project. Courtesy of Noah Belikoff, U.C. Berkeley. Arrival of the First invoice per Pacific Railroad. Almost daily for years some of the unfortunates who live at restaurants has been heard to say, "How I should like to be East once more to have a good feed of oysters." And then there generally ensues a conversation between the speaker and the waiter in regard to the merits of oysters found in different localities, concluding with a sigh from each. Since the completion of the railway, gourmands have anxiously awaited the coming of the month containing the letter "R," in the hope of receiving bivalves fresh from the Eastern shore. Yesterday a large invoice of fresh oysters, in the shell – the pioneer invoice – packed in barrels filled in with ice, was received and distributed among the principal dealers. 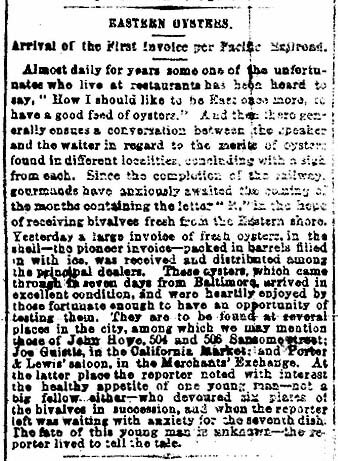 These oysters, which came through in seven days from Baltimore, arrived in excellent condition, and were heartily enjoyed by those fortunate enough to have an opportunity of testing them. They are to be found at several places in the city, among which we may mention those of John Howe, 504 and 506 Sansome street; Joe GuistIe, in the California Market, and Porter & Lewis' saloon, in the Merchants' Exchange. At the latter place the reporter noted with interest the healthy appetite of one young man – not a big fellow either – who devoured six plates of the bivalves in succession, and when the reporter left was waiting with anxiety for the seventh dish. The fate of this young man is unknown – the reporter lived to tell the tale.